Description: Rainier was a South African-born violinist and composer whose concerto was commissioned for this performance by BBC controller William Glock (hater of tonal music and despiser of anything not modern). Lasting around 19 minutes, it's a very austere work, often atonal and hard not to call grim; apparently the 18-year-old Du Pré, a musical conservative, gave it her all both in preparation, rehearsal and performance. Both concertos date from Sept. 3, 1964. 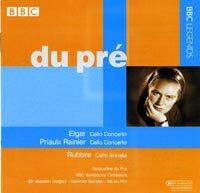 The July 6, 1962 mono recording of the Rubbra, from the Cheltenham Festival, offers a rarely heard and even more rarely recorded 1946 work, also austere, but here in Rubbra's mystical manner, with quasi neo-Baroque elements present as well. The long, 13-minute finale of variations and fugue is particularly striking. Jacqueline Du Pré (cello), BBC Symphony Orchestra; Norman Del Mar, Malcolm Sargent (Elgar), Iris du Pré (piano).